Willem de Vlamingh - was baptised, on 28 November 1640, as the son of Hessel Dirckszoon and Trijntje Cornelis on the island of East-Vlieland in the Netherlands. Because part of the Vlielanders livelihood was whaling his early seafaring experience had been on whale boats. He married Willempie Cornelis from Amsterdam on 2 December 1668 and settled in Amsterdam and its seafaring world. In 1688 he joined the VOC and on 26 November of that year he was on his way to Batavia. In May 1690 he returned to Holland. Four years later, on 7 January, 1694, he again departed for the East Indies and reached Batavia ten months later on 13 November that same year. On 23 August 1695 he was back in Amsterdam and was nominated for the responsible task of mounting an expedition to search for the Ridderschap van Holland. On 11 July, 1693, the capital ship, Ridderschap van Holland, had departed from the province of Zeeland, in the Netherlands, for the long trip to Batavia. Early in 1694 it had reached Cape of Good Hope but after sailing from there, she had disappeared with 325 passengers and crew - and was never heard from again. Somewhere in the Indian Ocean between the Cape and Batavia this enormous ship had come to grief. For VOC Board member Nicolaas Witsen this was the opportunity he had waited for. He had been aware that since Abel Tasman's journey in 1644 - nearly fifty years before - no serious attempt had been initiated by the VOC to further explore the Southland. He had tried a number of times to convince his fellow Board members of the need for such exploration but to no avail. The loss of the Ridderschap van Holland presented him with an opportunity to push for an inquiry and a thorough search of this area of ocean - i.e. the west coast of the Southland. As the fortunes of the Company were now a major issue his colleagues were more ready to listen. The search for the Vergulde Draeck, lost in 1656, had not been a great success but in spite of this the Board of the VOC resolved on 10 November 1695 to give their accord for the inquiry to proceed. Their motivation, manipulated by Witsen, was evident in a letter they sent to Batavia that day wherein it was mentioned that because there been suggestions that the Southland lies more to the west than the charts show, there was a good chance that the Ridderschap van Holland might have stranded upon the west coast of the Southland. The expedition, which was to leave from Batavia, would therefore look for a wreck, its survivors and at the same time, and once and for all, chart the whole west coast. It seemed that the Board considered it possible that after 40 years some of the Vergulde Draeck crew might still be alive in the Southland. In preparing the plans for the expedition the Board had nominated the Amsterdam Chamber of the VOC. This Chamber, in conjunction with Commander Hendrik Pronk and de Vlamingh himself, devised a strategy which was put before the VOC Board on 8 December 1695. In variation of earlier plans, which had stated Batavia as the starting point, now the Cape of Good Hope was proposed. In this way, the Ridderschap of Holland’s route could be retraced. Also, the islands Amsterdam and St Paul, which were en route, could be explored further and the search for survivors in general but particularly of the Ridderschap van Holland could commence. The strategy thus devised by the Amsterdam Chamber was taken over by the Board which immediately appointed a committee, consisting of representatives of the various Chambers, to decide how the plan was to be put into action. After two days - on 10 December, 1695 - the committee gave its report. It had introduced a modification and thought it essential to start the journey in Holland. Three ships, of which one would be newly built, would sail under the command of Willem de Vlamingh in March 1696 from Amsterdam. On the way the island of Tristan da Cuhna, in the Atlantic Ocean, was to be charted. The Board agreed on all points and preparations were started right away. The new ship to be built, a comfortable frigate of 110 -112 feet long, would serve as flagship of the Commander - Willem de Vlamingh. It was named Geelvinck after Joan Geelvinck, member of the Board. The Geelvinck would be accompanied by the Nijptang, with Gerrit Collaert as Skipper, and the Wezeltje, with Laurens Theuniszoon Zeeman as Skipper. The latter died en route and was replaced by Cornelis de Vlamingh (the son of Willem). The Muster Register, which kept a record of all departing Company ships, noted that Geelvinck had 130 people on board, Nijptang 50 and Wezeltje 14. Although Batavia had been advised that the ships would be ready to sail in March 1696, deVlamingh did not sail until 3 May, 1696. One person of note on board the Geelvinck was Victor Victorszoon who was described in the log as a ‘cranckbesoeker’ (visitor of the sick). However, the prime reason for his presence on the journey was because of his talents as an artist. He was to make drawings and keep records of all interesting point that they would encounter and his first assignment was Tristan da Cuhna. After charting Tristan da Cuhna the ships sailed for the Cape of Good Hope. At the Cape the ships' stores were replenished. Three ‘Indians’ were taken aboard, natives of southern Africa who spoke a variety of languages according to de Vlamingh’s Journal but the Nijptang's Journal states that there were four natives who between them spoke about 60 languages. With them de Vlamingh hoped that he could make himself understood in the Southland. 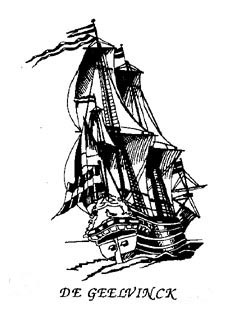 The ships stayed at the Cape for several weeks and on 27 October 1696 they started on their voyage to the East. 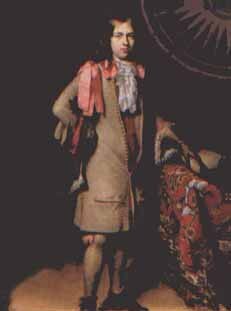 Cornelis de Vlamingh was now in command of Wezeltje because Laurens Zeeman, its skipper, had died. Their first destination was the islands of St Paul and Amsterdam and the former was sighted on 28 November. The following day a landing party explored the island looking for the remains of Ridderschap van Holland. This tiny island was the home of walruses and seals and they were so thick on the beach that the sailors had to kill some in order to gain access. They found a small river and a hot water geyser which was so hot that they could easily cook fish in it. There was no wreckage that indicated that the Ridderschap of Holland had been there and after Victor Victorszoon had made a drawing, Willem de Vlamingh nailed a pewter plate to a post inscribed with the names of the ships, skippers and the date. They then sailed to the island Amsterdam, situated 13 miles to the north. This island appeared a lot more fertile with a variety of vegetation and inhabited by a number of small mammals. In the streams was plenty of fish and lobster. So as to increase the survival chances of future shipwrecked people on the island, de Vlamingh gave orders to sow wheat, mustard seed and peas. Again there was nothing to indicate that the lost ship had been there. After allowing Victor Victorszoon time to drawn the island and nailing another plate to a post, like at St Paul., the ships weighed anchor on 5 December and continued their journey to the East. The crew on the Nijptang were the first to sight the Southland after sailing for 19 days. The descending darkness prevented the men on Geelvinck and Wezeltje to do the same and even the following day the land remained invisible due to overcast conditions and a strong current which pushed them northwards. It would still take another five days, on 29 December, that an island was sighted. Late in the afternoon the island, located at Latitude 32°S was reached. Because of the lateness of the day the investigation of the island had to wait until the following day. On Sunday 30 December 1696, de Vlamingh decided to use a boat from the Nijptang, with Collaert and a small crew, to sail around the island in the hope of finding salvage of the ship they were seeking. The Geelvinck's boat with the First Mate, the bookkeeper and 12 soldiers were sent to look over the island itself. Towards evening both groups returned. The bookkeeper reported that there were no people on the island but that there were large numbers of bosch-rotten. They had shot a number of them to show de Vlamingh. They were found to be dwarf kangaroos, a mammal still unknown in Europe at that time. In the journal of the Nijptang they were described as a kind of rat, the size of a cat, and large quantities of its excreta could be found all over the whole island. The island was named Rottenest. It is known as Rottnest today. From the holes that were dug on the island the men obtained good drinking water and of interest to the Company, they thought, would be the wood from trees on the island which had an exquisite smell - like rosewood. The following day de Vlamingh himself went on the land and he was very impressed with the smell of the wood. He ordered a large quantity to be cut and brought on board. During the exploration of the island they found some wreckage and a piece of timber containing nails indicating that a ship had been wrecked. They considered it not impossible that the timber came from the Vergulde Draeck. Meantime they saw that on the mainland, which stretched as far as they could see, many palls of smoke and on 3 January 1697 everything was made ready to investigate this. In the first instance a boat was sent to the mainland but because of the distance it was only able to carry out a short investigation. As a result a counsel was held and it was decided to mount a full expedition. Eighty six men and the ‘native interpreters’ who had been taken aboard at the Cape, would make the journey. Captain Collaert was in command. On 5 January, 1697, at sunrise, the expedition left in Wezeltje and the boats. The expedition would take nearly four days. On the first day, Collaert and all his men went inland. Near some small salty lakes they found human footprints, a small hut and more tracks of both adults and children, but of the natives nothing was seen. Because he thought that they might have been frightened off by the large group, Collaert decided to split the group into three - but to no avail. On the third day, Collaert split the group into two. The group that traveled along the beach found a piece of driftwood that looked like a ship's rib but judging by its condition it looked as if it had been there a very long time. When they arrived at the mouth of the river they sailed up it for some distance but it yielded little more than a couple of black swans - which they took to show de Vlamingh. Willem decided to go and have a look for himself. 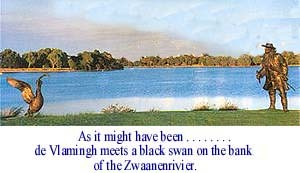 On 10 January 1697 he left with three boats to explore the Zwaanenrivier (Swan River). The group traveled some 12 miles up the river until shallow water stopped their progress. They made no contact with the natives and all they had to show for their trip were two black swans and some resin and gum from the trees. De Vlamingh had to concede that the land had little to offer and that the native population did not want to show themselves. Back on the ships, the council decided to continue the journey northwards and life on board returned to its routine. Keeping close to the coast, when the weather allowed, a number of landings were made and the coastline carefully recorded. No humans were sighted and the land was described as dry dunes and unsuitable for cattle and people. On 30 January 1697, de Vlamingh sighted another island which he thought to be Dirck Hartogh’s island. The Geelvinck and Nijptang were sent ahead to circumnavigate the island and find a good anchorage. In the meantime, de Vlamingh did his own exploring. On 3 February, both boats returned. The First Mate reported a startling discovery. When he had climbed a hill to get a better view, he had found a pole with a pewter plate half hidden in the sand. The writings on it stated that it had been left behind by Dirck Hartogh in 1616. It was now certain that de Vlamingh had landed on Dirck Hartogh's island and the next day the ships sailed into a sheltered lagoon. From here they spent nine days exploring the surroundings and making accurate charts. This was not entirely without danger for on 7 February one of the boats capsized because of a sudden gust of wind. In that boat was Cornelis de Vlamingh, Willem’s son, who managed to save himself and with others was rescued by Wezeltje. Only the ships carpenter drowned. For the rest, the island did not reveal much. It was uninhabited and the home of many seabirds and turtles. The retourship 's Lands Welvaren took the report to Holland as well as the eleven drawings done by Victor Victorszoon (namely seven of various location of the Southland, one of the island Tristan, one of the island Amsterdam, one of St Paul and one of Mony), Dirck Hartogh's plate, a box with sea shells, fruits and vegetation which de Vlamingh had gathered and a bottle of oil, extracted from the exquisite smelling wood found on Rottenest were also sent. It was also intended to send some black swans but they had died on the journey. De Vlaming, his son and Collaert returned later because they had been dispatched, shortly after arrival, to Bengal and had not returned when ‘s Lands Welvaren left Batavia. They departed the Indies on 3 February 1698, Willem de Vlamingh as Commander of the Fleet on board the Gent, Collaert as skipper on the Carthago and Cornelis de Vlamingh as First Mate on Boor. On 16 August 1698, the ships arrived in Amsterdam. Nicolaas Witsen, the instigator of the expedition, was very disappointed with the result and at first blamed Willem de Vlamingh but later his mood mellowed somewhat. Thanks to de Vlamingh’s exact observations, it was possible for the VOC cartographer in Amsterdam, Isaac de Graaff, to draw a detailed map of the West Australian coast from latitude 20°S to 32°S. Besides that, de Vlamingh had successfully surveyed the islands of Tristan da Cunha, Amsterdam and St Paul, with Mony as an extra bonus. His findings for once and for all established that for the VOC there was no profit to be made on the West Australian coast. The Dutch would not carry out any further exploration. After his return to Amsterdam, de Vlamingh probably left the VOC for there are no further records of him. The pictures of Victor Victorszoon somehow were lost and in more recent times ‘re-discovered'. Dirck Hartogh's plate, which de Vlamingh took with him, is now housed in the Rijksmuseum in Amsterdam. The plate which de Vlamingh left in its place on Dirk Hartog Island is now on display in the West Australian Maritime Museum in Fremantle. On 11 February 1697, the task was at an end and de Vlamingh made ready to sail. Before he departed however, he gave instructions to inscribe a pewter plate, like Dirck Hartog had done in 1616, and had it nailed to the pole at exactly the same spot. He took Hartogs’s plate with him. They weighed anchor on the 12th and sailed northwards. He remained as close to land as possible until Latitude 20°S. On 21 February, he veered away from the Southland and commenced the last leg of his journey to Batavia. On the way they explored the island Mony, south-west of Java (now known as Christmas Island), and on 20 March 1697, after a journey lasting 11 months, he arrived in Batavia. For the Board of the VOC the results must have been disappointing although that was due more their own high expectations than de Vlamingh’s failure. What was not there, could not be found. Return to VOC Historical Society's Home Page. The expedition at the mouth of the Zwaanenrivier.